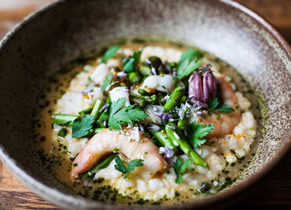 Centrally located in the heart of Savannah’s Landmark Historic District, Husk transforms the essence of Southern food. Executive Chef and Savannah native, Chris Hathcock, reinterprets the bounty of the surrounding area, exploring an ingredient-driven cuisine that begins in the rediscovery of heirloom products and redefines what it means to cook and eat in the South. Bootleg Farm is a small family farm that produces and sells fresh, farmstead goat cheese and pet grade raw milk. We are Grade A licensed by the Georgia Department of Agriculture and the USDA.